Rwanda's defence minister is effectively commanding a rebellion in the Democratic Republic of Congo, UN experts say. The confidential report, leaked to Reuters agency, says Uganda is also backing the M23 rebels, who have been fighting the DRC's army since April. The document builds on a UN report published in June which accused Rwanda of supporting the insurgents. Rwanda and Uganda strenuously deny supporting the rebellion. The BBC's Barbara Plett, at the UN, says that during the past two decades Rwanda has backed armed groups in the east of DR Congo as a way to fight Hutu rebels who fled there after the genocide of the 1990s. Some accuse Rwanda of using militias as proxies in an on-going battle for the region, which is rich in minerals, our correspondent adds. The latest report by the UN Security Council's Group of Experts provides more details of Rwanda's alleged continued involvement. It also says Kigali has supplied the M23 with heavy weapons and stepped up recruitment for the group. Both Rwandan and Ugandan officials have strongly denied the accusations made in the report. Olivier Nduhungirehe, a senior Rwandan diplomat at the country's UN mission, said the United Nations experts had been "allowed to pursue a political agenda that has nothing to do with getting at the true causes of conflict in the eastern DRC". Uganda's foreign minister, Henry Okello Oryem, told the BBC that the UN was seeking to blame others for the failure of its own peacekeeping force in the eastern Congo. 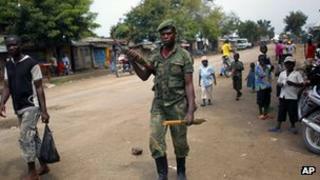 But the the DRC's ambassador to the UK, Kikaya Bin Karubi, said the UN "must act" on the basis of the report. He told the BBC's Newsday programme: "When the chief of staff of an army, a minister of defence of a country creates a rebellion, supplies weapons, sends troops to fight against a legitimate government across the border, I think this is serious." The report - seen by Reuters news agency on Tuesday - says army units from Rwanda and Uganda have helped M23 expand its control of territory in eastern DR Congo. "Both Rwanda and Uganda have been supporting M23," according to the 44-page report. "While Rwandan officials co-ordinated the creation of the rebel movement as well as its major military operations, Uganda's more subtle support to M23 allowed the rebel group's political branch to operate from within Kampala and boost its external relations," it said. The UN report says former Congolese General Bosco Ntaganda controls the rebellion on the ground and M23 leader Col Sultani Makenga is in charge of co-ordination with allied groups. But it says M23's de facto chain of command culminates with Rwanda's defence minister. Gen Ntaganda, who is known as "the Terminator" and is wanted by the International Criminal Court (ICC) for alleged war crimes, has fought for various militias over the years. The rebellion started in April, when a militia that had been absorbed into the Congolese army mutinied and went on the rampage in the eastern part of the country. Since then nearly half a million people have been displaced by fighting between the M23 and the army. The violence has drawn international condemnation and the US and some European countries have withheld aid from Rwanda.